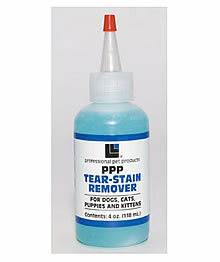 Professional Pet Products offers a gentle, safe gel formula effectively removes tear stains from beneath the eyes. Can be used on puppies, kittens, cats and dogs. Available in 4 ounce bottle. Sodium Laureth Sulfate, Cocamidopropyl Betaine, Disodium Oleamido MIPA Sulfosuccinate, Carbomer 940, Triethanolamine, Glycol Stearate, Propylene Glycol, Methylparaben, Propylparaben, Diazolidinyl Urea, Citric Acid, Blue 1.